This entry was posted in Important Society Issues on January 24, 2014 by Steve Tilford. Today is the 30th anniversary of the Apple Macintosh computer. It was back in January of 1984 that it originated. Man, how time flies and things change. I’d say the biggest change in my lifetime is how small the world seems now because of computers, the internet and smart phones. I couldn’t have imagined the direction of it all back during the Olympic games in LA, in 1984. The information that we have at our finger tips, at all times, is unlimited pretty much. Anytime I need an answer to virtually any question (a question that has a definite answer), I have it. Much of this is because of Apple and its products. I’ve been an Apple fan for a long time. I don’t come close to using their products as they should be used. I barely tap the fringe. Each one of my Apple products have the ability to do 10,000 X as much as I use them for. That is the beauty of their products, they are very user friendly for pions like me and also for researchers, designers and artists that are on the cutting edge. I couldn’t even have imagined 10 years ago that any of us could be sitting at home, eating breakfast, watching World Cup Cyclocross from Europe, live on our laptops. Or virtually any other event in the world that has video coverage. It is truly amazing. We can even watch on our phones while on the move. Unbelievable. I started buying Apple stock a long time ago. I made the decision by making observations during travelling to races. Years ago, when I went into a coffeeshop before a race, there would be maybe one Mac laptop to 10 windows computers. I noticed a very slow, but definite increase of little Apple symbols on the laptops, month by month. I realized that way more students were then using Apple computers than previously. So I bought some stock. This was way before the iPhone. The iPhone was obviously a game changer for Apple, the company. Nearly all their profits are derived from this one product. It is what defines the company now, the Mac took a back seat to them. Monday, Apple is going to announce its 4th quarter earnings. They are going to be record earnings most likely. Maybe not record enough to make the institutional investors happy. Apple is not a loved stock by many right at this moment. But, they are hoarding an enormous amount of cash. I saw an article last February that said Apple had enough cash in the bank they could acquire Facebook, Groupon, LinkedIn, Netflix, Pandora, Research In Motion (Blackberry), Yahoo, Yelp, Zillow and Zynga —and have more than $2 billion left to spare. Of course the dynamics of all those companies have changed in a year, but they are still sitting on a huge stockpile of money. Anyway, it has been an interesting journey for Apple. We’ve all benefited from their innovations and focus. Hopefully they will continue with these things into the future. I can’t come close to imagine what they’ll be doing 30 years from now. The original Macintosh from 1984. A rendition of Apple’s futuristic campus. To each his own. I’m a PC guy. In fact, right now I’m right in the middle of a really exciting build. Just got my new motherboard and a video card yesterday from newegg. It was time for an upgrade. My son has been complaining for some time that his Minecraft game has been “lagging”. Lol. Although overall, we’re a PC family. My Dad tells me stories of him being in line in the basement of Cardwell Hall at K-State in the 60’s with his stack of punch-cards waiting his turn for the mainframe to run his program. Can you imagine? It is incredible what can be done these days. I got into a discussion the other day with a friend about how the barber shop pole came to be. I was able to just google it from my phone. If you’re curious make sure you’re not eating anything when you read about it. Anyway, I’ve never spent one single penny on anything Apple and I never will. I just really enjoy the customization and flexibility of a PC. So are you a secret millionaire? Time to sell all the Apple stock. Between the discounting that Jobs would launch into one of his legendary tantrums if his enablers openly suggested it and Apple patent litigation factory, there’s nowhere to go for the company’s valuation to go but down. Sure, blind faith in the valuation, accounting tricks, and cost cutting will keep the numbers up for a little while. (2 years?) The upward trajectory is done. I’m not sure your ‘customization and flexibility’ statement holds much water, unless you are expressly talking about hardware configuration. The operating system on an Apple is a derivation of BSD Linux/Unix. Basically anything you can run on a linux machine you can run and build on a mac. In this regard it is one of the most flexible development platforms available. The Mac OS has come to dominate the web development side of the software world in large part because of their flexibility to run and support such a vast array of platforms and languages. As a huge supporter of Open Source Software, Apple does a ton of things that I hate and begrudge, and there are a million reasons not to support them, just probably not these two reasons specifically. The only Apple item I own is an old ipod. Hate the company and their “we’re just a bit better than you” persona. Their earnings and market share have been steadily falling over the past few years, and between their overpriced computers and overly fragile phones will surely continue to do so. It was around 1981of 82 when I bought an Osborne 1 “portable” computer with 64k of RAM and wrote software in CP/M Basic to calculate our stage race results after a particularly disastrous 3-hours of trying to get GC results straight using index cards and officials’ notes before the free lap rule and finish line cameras existed. When DOS appeared I ported the program over to early laptops and we continued to use it for years but eventually I rewrote everything for Windows Excel. In the meantime, however, I wrote Apple Basic software on a borrowed Apple II (without lowercase) for sales and internal billing at work, and later used an Apple IIc, but then the university bought IBM desktops for the offices and so I never had my own Mac (although frequently had to fix the ones my boss used). As far as I can tell the main special attraction now for the Mac is the cute light-up Apple logo and the fact that all the cool kids use them. Otherwise, it’s really just another fun computer that often doesn’t play well with the larger corporate software systems. Great for coffee shop work, however! Basically anything you can run on a linux machine you can run and build on a mac. No, not basically. I was bitten by this false claim. There was at least one packaging system that tracked, compiled all the patches and workarounds needed to get Unix-ish programs working on mac BECAUSE of Apple’s BSD implementation. The Mac OS has come to dominate the web development side of the software world in large part because of their flexibility to run and support such a vast array of platforms and languages. Moreso because of Adobe’s continued support of Apple’s OS than anything else. Not sure that I would characterize Apple as a huge supporter of Open Source software either. They frequently “stand on the shoulders of giants,” pretending they are a giant. (web browser core, open source toolchain, among others) Yes, they do contribute to projects and in fact own CUPS. I had an original Mac and kick myself everyday for NOT still having it. I like apple too but in 30 years it will be a small part of Google. written on my apple running windows ironically…. You’re not alone. Not many know this, but it say a lot about *pples. And still the most innovative after these 30 years. 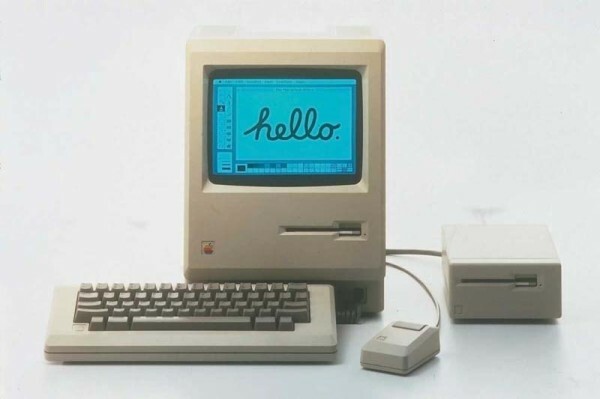 Go ahead, Happy 30th to the Mac! ….I don’t use any Apple products. Along with Google and Facbook they make billions of dollars. But yet they only pay 2-8% in taxes here in the US. It’s all hidden overseas. What tax bracket are you in?